Informed by art historical and literary sources, Njideka Akunyili Crosby’s complex, multi-layered works reflect contemporary transcultural identity. Combining drawing, painting and collage on paper, Akunyili Crosby’s large-scale figurative compositions are drawn from the artist’s memories and experiences. She uses the visual language and inherited traditions of classical academic western painting, particularly the portrait and still life. Akunyili Crosby’s characters and scenes, however, occupy the liminal, in-between zone that post-colonial theorist Homi K. Bhabha refers to as ‘the third space’, a point of overlap, conflation and mixing of cultural influences specific to diaspora communities. She is the 2015 recipient of the Joyce Alexander Wein Artist Prize from the Studio Museum in Harlem. She received her MFA from Yale University of Art and her BA (Honors) from Swarthmore College. 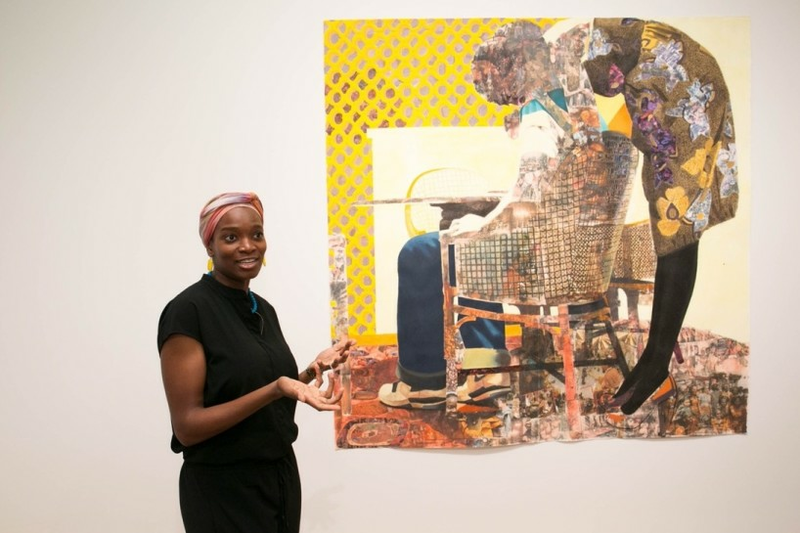 Njideka Akunyili Crosby is currently represented by Victoria Miro Gallery in London. Her works have been featured at international museums and in institutional collections including The Norton Museum of Art, The Whitney Museum of American Art, The Hammer Museum, Art + Practice, Tiwani Contemporary, Sensei Exchange, Franklin Art Works, Gallery Zidoun, Modern Art Oxford, 32 Edgewood Gallery, The Moore Building, The Studio Museum in Harlem, The Rubell Family Collection/Contemporary Arts Foundation, New Museum, Stevenson Gallery, Landcommandery of Alden-Bisen, Brand New Gallery, Marianne Boesky Gallery, BRIC, Bronx Museum, American Academy of Arts and Letters, Brooklyn Academy of Music, Clifford Chance US LLP, Museum of New Art Detroit, Benrimon Contemporary, Swarthmore College List Gallery, Kravets/Wehby Gallery, Green Gallery, Hunter College Times Square Gallery, Yale University Art Gallery, San Francisco Museum of Modern Art, The Pennsylvania Academy of the Fine Arts, The Nasher Museum of Art at Duke University, The Tate Modern, The New Church Museum, Zeitz MOCAA, Los Angeles County Museum of Art, and The Museum of Modern Art.